The Sirius Star® Square not only features greater scintillation and increased light return, improved brilliance but also higher visual appeal than any other square shape. Who needs hearts and arrows when you can see the stars? This design was inspired by countless requests from our partners- radiantly inspired. In addition to improved performance, the corners are cut to prevent any possible wear and tear damage as these tend to chip on other square shape. Setting the Sirius Star® Square is a goldsmith’s dream. 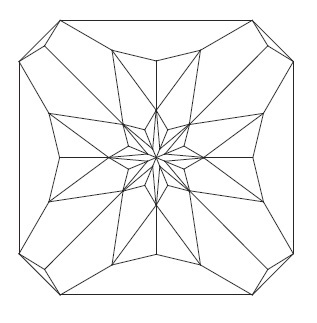 Sirius Star® Square features 88 inclined facets (octagonal main facet design with four-tier pavilion). All the facets are indexed and inclined to present the maximum actual and virtual facet definition.